Nicole and I passed through Washington DC last week and spent a day wandering around the massive National Mall. The mall is where most of the famous sites in DC are, including the White House, Capitol Hill and the Washington Monument. It was fun to walk around and see the big sites that we recognize from dozens of movies, but it was the numerous museums in the area that made the trip worthwhile. 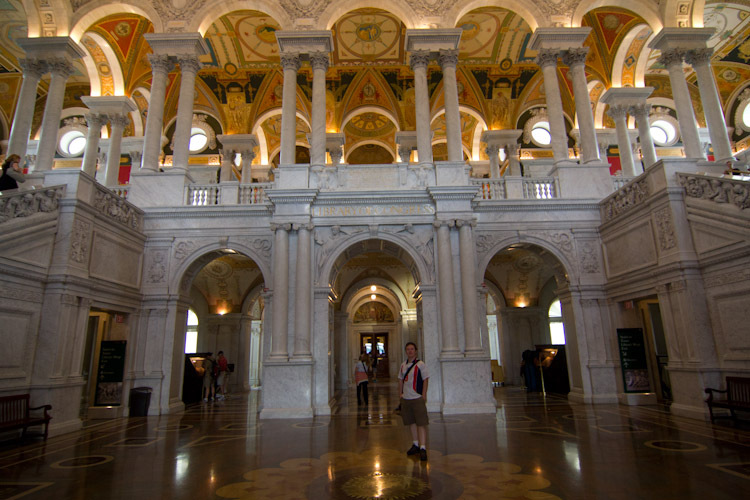 The highlight of the trip was visiting the Library of Congress. 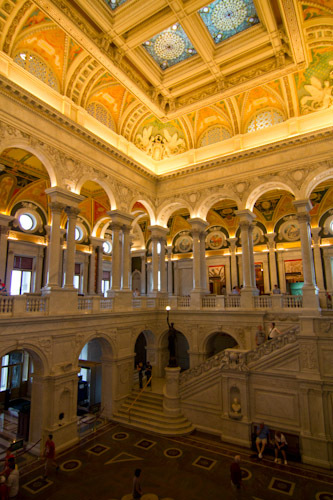 The building itself exudes an air of learned altruism, expressed with painstaking attention to detail in the art that lines every wall, ceiling and staircase. We were happy to have taken the tour, as our docent was knowledgeable about the origin and symbolism of many of the paintings and sculptures which cover every inch of the building. The walls are covered with famous quotations and tributes to prominent figures in human history, and it is time well spent to walk the halls at a leisurely pace and contemplate their meaning. 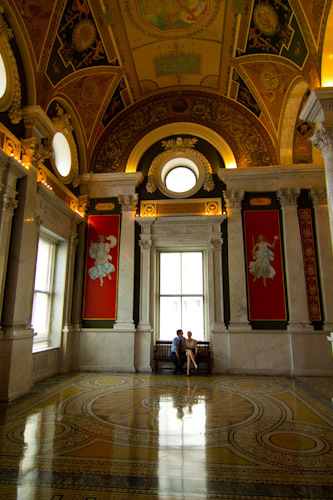 The strong presence of Minerva in many of the art pieces makes it clear that the Library of Congress was designed to be not just a reference library for congress, but also a force for education and the expansion of human knowledge. But even surrounded by all the polish of altruistic scholarship, there were some peculiarities that reminded us we were in America. Certainly American scientists, artists and writers were given special prominence in many paintings and placement, but that is to be expected in the capital of any nation. 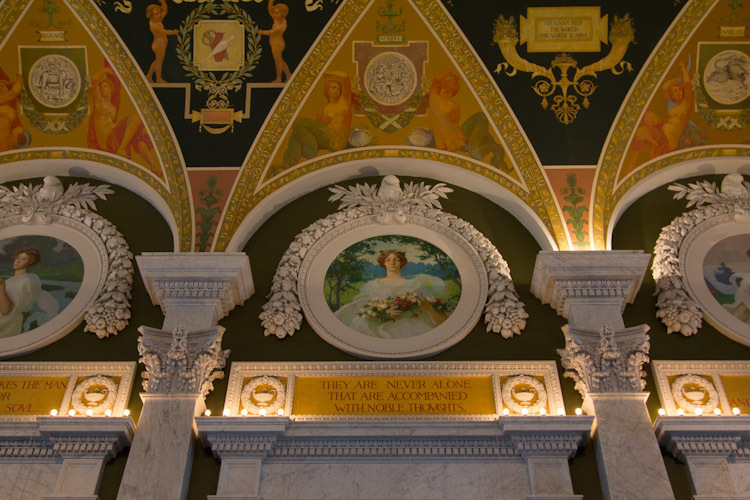 I can even look past the fact that the circular mural in the main dome of the reading room boldly credits America with inventing "Science", while Germany was noted only for "Printing", Greece for "Philosophy", and England for "Literature" - At least Isaac Newton had made an appearance in some of the other artwork. There was one thing, however, that I can't forgive, and it came from the lips of our tour guide. While he was running us through the history of the library, he came to the war of 1812, and it stung my floppy English/Canadian ears to hear his version of events! The British invaded Washington in 1814, and since they knew they wouldn't be able to hold it for long, they tried to burn as much of it as they could. Unfortunately for the library, books are a good way to start a fire, and so over half the collection was lost in the fire before the British were repelled back to Canada. It has since been confirmed that many Americans know only this abridged version of the war of 1812, which completely omits the fact that it was the Americans who declared war on Canada, and that the Americans had burnt the government buildings of Upper Canada in York (now Toronto) only 2 years earlier. Indeed, it seems the commonly held view is that the British were barbarians who burned books and razed cities for no good reason. There is evidence that shows civility in how the British conducted their warfare, which cannot be said when reading about American attacks on Upper Canada. For example, the soldiers who burned Washington were under strict orders to burn only public buildings and to spare all civilians and their buildings. 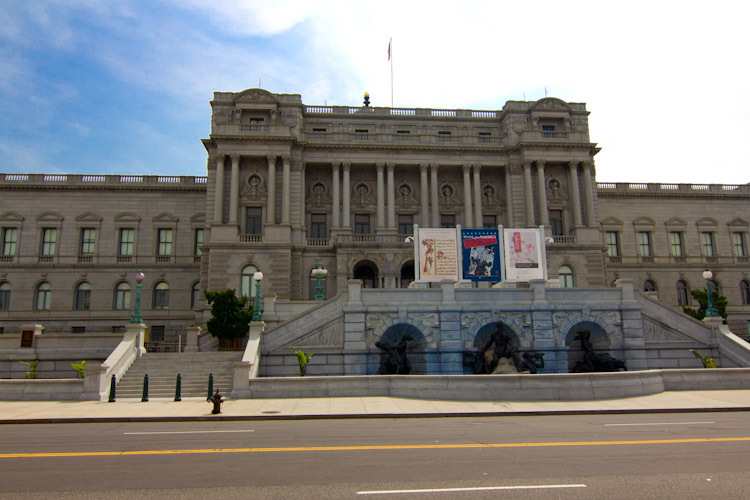 The library, being a small part of the building which housed congress at the time, was a casualty of war. Given the immense value of books at the time, you have to believe that if they could have, the British would have stolen every book in that library and sailed them straight back to Britain. 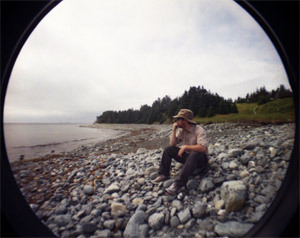 Other accounts of the occupation of Washington sound distinctly different from the raids conducted by Americans on the north shore of Lake Erie. In fact, in reading about some of the battles, I find it a shame that modern warfare can't be conducted with a little more civility and respect. "The day after the destruction of the White House, Rear Admiral Cockburn entered the building of the D.C. newspaper, the National Intelligencer, intending to burn it down. However, several women persuaded him not to because they were afraid the fire would spread to their neighboring houses. Cockburn wanted to destroy the newspaper because its reporters had written so negatively about him, branding him as "The Ruffian." Instead, he ordered his troops to tear the building down brick by brick, ordering all the "C" type destroyed "so that the rascals can have no further means of abusing my name".